Designed by Apple in California, but where is it made? 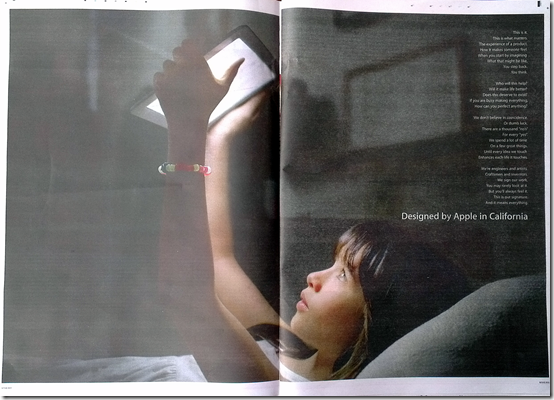 I opened up The Age newspaper today (yes, the dead tree version), to find a double spread promoting ‘Designed by Apple in California’. It’s the picture of divine innocence. 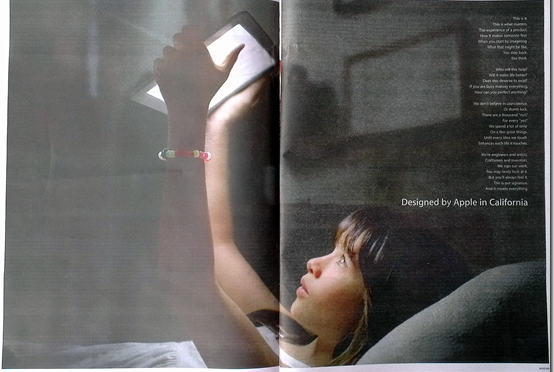 A young girl lying in bed bathed in light from a tablet she holds above her. The accompanying text reflects on the ‘experience of the product’ and the discipline exercised by ‘engineers, artists, craftsmen and inventors’ to ensure that Apple products enhance that experience. The latest Apple advertising campaign involves a commitment to sign its products ‘Designed by Apple in California’. There are two elements worth noting in this attribution. First, it specifies California rather than USA. With the upcoming Steve Jobs biopics, this may be to draw on the romance of free-wheeling Silicon Valley as a cradle of digital invention. It potentially helps counter with any resentment at US monopolies on soft and hardware patents. Second, it is more common to identify where a product is made, rather than designed. The question of where Apple products are made has been the source of some anxiety, as it has been revealed these treasured devices involve considerable exploitation of workers in Southern China. It’s about design, not manufacture. Design takes on the responsibility of production by becoming a craft, a focused exercise towards the achievement of a singular goal. Control is everything to Apple. Compared to other platforms, it strictly regulates access to its system by other hardware or software providers. Its power is to say ‘no’. While a quintessential feature of modernist design, this control can come at the expense of serendipity, when bold invention comes from trusting in chance. Apple says no. One of the richest corporations in the world has no featured philanthropic program. Now it attempts to repress the nature of its outsourcing of manufacture. Can they really call themselves craftsmen?